The Cedar Rapids Downtown Farmers’ Market is one of the Midwest’s largest open-air markets. The event averages 14,000 patrons and over 200 local Iowa vendors per market. The event features an array of products from fresh produce and flowers to meats and artisan gifts. When is the Farmers Market in Cedar Rapids? What are the Cedar Rapids Farmers Market Hours? 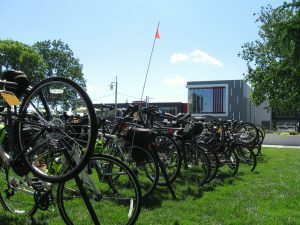 Linn County Trails Association supports the Cedar Rapids Downtown Farmers’ Market with valet bike parking. 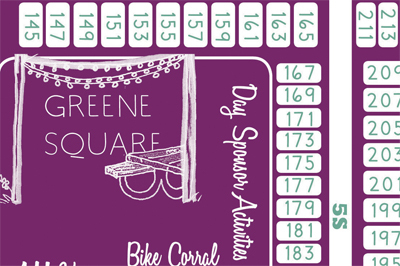 Our bike corral is located in Greene Square near the corner of 4th Ave and 5th Street SE. You simply can’t park closer to the Farmers’ Market than when you use our valet bike service! In order to encourage people to ride the Farmers’ Market, the Linn County Trails System provides free and secure bicycle parking. Friendly LCTA members are always on hand to provide recent trail updates and answer questions. Swing by our booth and grab a trail map and LCTA goodies — and learn how you can support trails in Linn County.